Early biotechnology studies in Division of Industrial Chemistry during World War II involved the use of enzymes for the removal of wool from sheep-skins and sheepskin pieces. As part of the war effort the activities broadened to include the production of power alcohol through fermentation and the generation of precursors for the production of synthetic rubber. Observations on bacterial fermentations during this research were to later find practical application in a totally different field, the recovery of wool from sheep-skin pieces. The traditional process, called ‘pieing’, involved leaving piles of sheepskin pieces to rot on the fellmongers floor. It was an awful process, especially for the men who had to recover the wool from these putrid collections. The wool was discoloured, brittle and stank. When a successful lab scale process developed by Tom Pressley failed under industrial conditions, his colleague Gordon Crewther recognised the problem. He had seen it all before in his studies on bacterial fermentations. The conditions in the fellmongers were anaerobic and dominated by Clostridia, while in the successful laboratory trials the conditions were aerobic involving different bacteria. Within a few days, the details of a new process were established and successfully demonstrated in a commercial fellmongers. The wool produced was so good it was sold at a premium as ‘lambs wool’. The price: more that 5 shillings per lb compared to 3 pence per lb for the traditional product. The process was assessed to be worth £8 000 000 per annum to the sheep, wool and fellmongering industries in the early 1950s. In September 1940 Dr FG (Gordon) Lennox transferred from the Division of Economic Entomology in Canberra to the Division of Industrial Chemistry in Melbourne. The latter division wanted a biochemist with bacteriological knowledge to head up a new Section to work initially on fellmongery and leather but later on other topics the Division deemed important. It was initially named the Leather and Fellmongery Section and dealt with the processes for recovering large quantities of wool from quality woolskins destined for tanning into chamois leather. This involved loosening the wool either by coating the back of the skins with sulphide solutions or by allowing bacteria to produce proteolytic enzymes on the skin by the ‘sweating process’. Lennox’s interest in proteolytic enzymes stemmed from his earlier work on blow-fly strike in sheep while employed in the Division of Economic Entomology. He and his colleagues Bill Ellis and Margaret Maxwell, investigated the use of enzymes (proteases) rather than bacteria to accelerate the de-wooling of skins and studied a protease produced by the mould Aspergillus oryzae and another extracted from the weed Euphorbia lathyrism (Caper Spurge). They studied the production of the A. oryzae enzyme in bulk using bran as a substrate with a view to using it on an industrial scale. They were also interested in improving the process for the recovery of wool from damaged skins and skin pieces. The existing practice involved stacking the sheepskin pieces in piles on the floor of the fellmongery, allowing bacteria to totally breakdown the skin material but not the wool fibre and then recovering the wool from the resulting mess by scouring. During the Second World War, the section was renamed the ‘Biochemistry Section’ when it was asked to undertake industrial fermentation research to assist the war effort. One project, suggested by Dr Alfred Gottschalk of the Walter and Eliza Hall Institute, and carried out by Margaret MacArthur, involved exploiting the Pasteur effect, (the inhibition of fermentation by oxygen), to increase the efficiency of power alcohol fermentations. Another project involved the production of precursors for synthetic rubber production. Rubber was scarce at the time and 2,3-butanediol was selected as a suitable compound for conversion to butadiene, an intermediate used for the preparation of synthetic (Buna S) rubber. In 1943 Gordon Crewther was appointed to undertake studies on the production of 2,3-butanediol by fermentation of molasses or wheat using Aerobacter aerogenes or Aerobacillus polymyxa. A chemist in the Organic Chemistry Section, of the Division of Industrial Chemistry, Dr Malcolm Smith, was investigating the catalytic conversion of the diol to butadiene. The first requirement was the production by fermentation of enough diol for Malcolm Smith to carry on his research. So Crewther studied the enzyme system responsible for hydrogen production. The conventional view, based on the conclusions of Professor Marjory Stephenson, the famous Cambridge University microbiologist, was that a single enzyme, which she termed hydrogenylase, was responsible. She had shown that washed bacteria of species such as Aerobacter aerogenes and Escherischia coli produced hydrogen from formate solutions leading her to conclude that the formation of hydrogen from glucose metabolism must involve the production of formate as an intermediate. Crewther found that this was not so. He demonstrated that when washed E. coli or Aerobacillus polymyxa were mixed with various sugars, both hexoses and pentoses, hydrogen was produced immediately, linearly with time, indicating that the production of formate as a precursor in the process could not possibly be involved. Instead Crewther concluded that two enzymes ‘ a dehydrogenase and a hydrogenase ‘ were involved. It was apparent to Crewther that the enzyme hydrogenase, which had already been identified in E. coli, behaved as a catalyst like platinum black, and could facilitate the conversion of hydrogen to electrons and hydrogen ions or the reverse. He concluded that the system involved in hydrogen production consisted of a dehydrogenase feeding electrons into a redox system with a suitable E0 value (similar to the viologen dyes) producing a sufficiently negative redox potential to enable the second enzyme, the hydrogenase to combine the electrons with hydrogen ions in the medium to produce atomic, and hence molecular, hydrogen. In 1949 Gordon Lennox arranged for Gordon Crewther to join Dr Ernest Gale and his group of microbiologists in the MRC Unit attached to the Biochemistry School of Cambridge University. This was the laboratory where Marjory Stephenson had established her reputation as one of the leading microbiologists in the world. During this trip Crewther spent some weeks visiting outstanding biochemists and microbiologists in France, Germany, Holland, Belgium, Denmark, Sweden and Norway as well as centres of research throughout Great Britain on other occasions. People visited included AndrÃ© Lwoff, Jacques Monod, Helmut Zahn, Francis Crick and William Astbury. 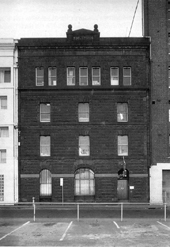 Several years later when the Biochemistry Section of the Division of Industrial Chemistry moved to its permanent home at 343 Royal Parade, Parkville, Gordon Crewther shared a room with Tom Pressley who was trying to improve the quality of wool recovered from sheep skin pieces and damaged skins. This was traditionally done by the ‘pieing process’ in which the skin pieces were piled in a heap on the floor of a fellmongery and allowed to rot. It was done because wool was in high demand and prices were escalating. The wool produced was black, stinking and brittle and sold for 3 pence per lb. A group of three scientists had worked on this problem for four or five years without success. They had shown that heat denaturation of the skin proteins accelerated the process and that this could be further accelerated by adding a protease produced by the mould Aspergillus oryzae. However, despite these advances the wool remained black, stinking and brittle. To get around this problem Tom Pressley was trying a modified approach in which he was suspending the sheepskin pieces in warm water and allowing the concomitant bacteria to digest the skin. Although he obtained white wool when he used sterile clean glass jars for the process in the laboratory the same black, stinking, brittle wool resulted when digestion pits in the fellmongery were used. He was nonplussed. Within days a fellmongery in WA employed a chemical engineer to do a pilot study in an oil drum and the process was then put into full-scale production with the liquor drawn from the base of the pits and aerated by spraying into the vats. The wool produced was white, pleasant smelling, strong and found to have a softer ‘handle’ than shorn wool. The company incorporated it in their lambs wool which sold for more that 5 shillings per lb. The process was assessed to be worth £8 000 000 per annum to the sheep, wool and fellmongering industries in the early 1950s not to mention the improvement in air quality in South Kensington and nearby suburbs. Rivett DE, Ward CW, Belkin LM, Ramshaw JAM, Wilshire JFK, 1996, ‘The Lennox Legacy – A History of the CSIRO Laboratory at 343 Royal Parade Parkville’, CSIRO Publishing, Melbourne, Australia, pp.370.